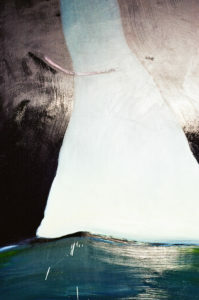 The Brazilian artist shapes improvisation into her paintings. Artist Gabriela Giroletti taps into recurring symbols and motifs in her crave to communicate caught moments and lived experiences through painting. Her “still lifes of weird stuff” come in different forms and sizes – from minuscule to considerable dimensions – all reminiscent of things we can identify through our own perceptions, such as mountains, blobs, or funnels. 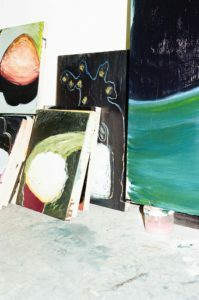 Consistently layered by colour and recurring motifs, her primitive paintings made by raw materials display her process-making techniques, where improvisation and mistakes are fundamental to her practice. Gabriela Giroletti (b. 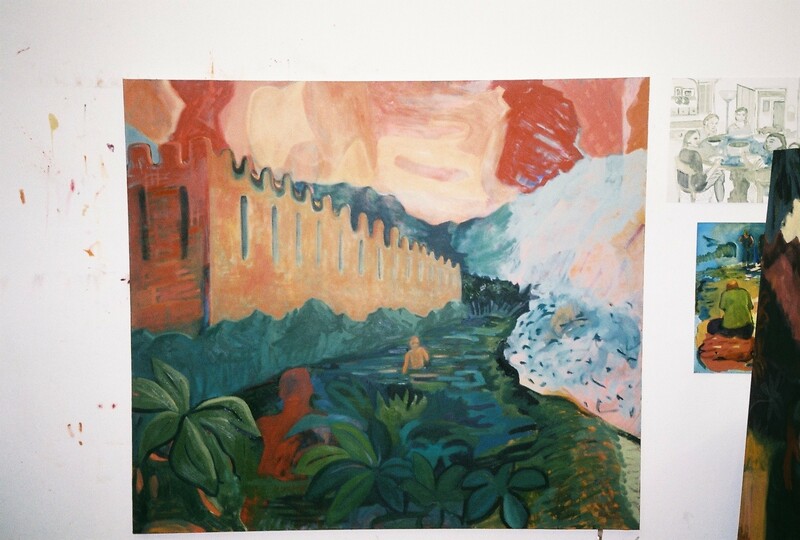 1982 Brazil) studied a Bachelor in Fine Arts in Painting and Sculpture at Middlesex University, London; and is currently undertaking an MFA in Painting at UCL, Slade School of Fine Art, London. 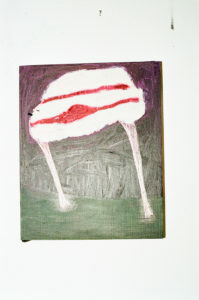 She has exhibited at Refugees Museum, Thessaloniki; Slade School of Fine Art, London; Chalton Gallery, London; Architectural Association School of Architecture, London amongst others. Residencies include JOYA Arte y Ecologia Residency – Velez Blanco, Spain (2017), TFAC Residency – Griffin Gallery, London (2017), Green and Brown Residency, Ouessant, France (2014). She has been shortlisted for BEEP Wales Painting Prize (2016) and has obtained the Dean’s Prize for Academic Excellence, Middlesex University, London (2015). She is currently living and working in London. You studied a Bachelor of Fine Arts at Middlesex University, London and are currently undertaking a Masters degree on painting at UCL, Slade School of Fine Art London. What inclined you to study art initially and why did you decide to come to London to do so? My interest in Fine Art started when I enrolled for a Museology course in my hometown. Having previously spent some time in London (in 2007), coming back here for a Fine Art Degree felt like the right thing to do. You have recently undertaken a residency programme at JOYA Arte y Ecologia, Velez Blanco, Spain. How was your experience in this natural environment, surrounded by mountains and land? Did your works shift style due to your surrounding environment? Joya was great. To have a break from my London studio was the main idea behind this venture but when I got there I understood there was a lot more to be taken from that experience. They are completely off-grid, generating their own electricity, managing waste, sourcing food locally and working the mountainous terrain to save rain water, which is very scarce in the summer. I took on this idea of working with nature and ended up working a lot en plein air. The style didn’t shift but the mountain motif became stronger after my stay there. 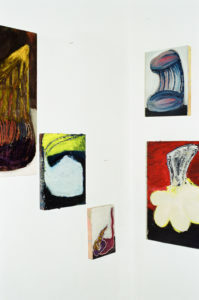 A combination of a figurative abstraction seems to be present in your pieces – with works that seem as bodily parts such as tongues to bodily shapes but in the same way have an ‘object’ feel to them. Are you interested in the figure? The figure is just another element among many others; I borrow things here and there. That is to say that I have the same interest in a tree branch and in an arm. Your works seem to reflect recurrent symbols and motifs. We understand this is an intuitive outcome. Could you expand on your recurring shapes and representations? My paintings are the by-product of a range of everyday stimuli, accommodating music, film, literature, photography and nature. Although the influences are many, some motifs appear quite frequently, especially when improvising. I recognise a few recurrent motifs, the mountain, the blob, the funnel, and other forms that evoke body parts, becoming quasi objects… a still life of weird stuff. The process when making your works involves a physical aptitude. Is it important for you to reflect this ‘suffering’ or ‘physical exhaustion’ along with traces of tools upon your works? Not in the sense of discomfort and torture, the “violence” you are acknowledging (the scratching, the scraping and the roughness of paint application) is the way I found to explore the material quality of paint and is something that I get great pleasure from. I do not use paint in an illusionistic way, the material has to be present as raw as possible. I rely a lot on improvisation, working each layer as a response to the previous. The scratching and scraping allow me to share my process with the viewer. You mainly work on wood instead of painting on canvas. Why do you choose wood as a medium? Wood is a lovely surface to work on. I can scratch and scrape more strongly on the surface without the fear of tearing. It is less practical to transport and store and if I buy ready made boards it is more expensive than working on canvas. At the moment the work ranges from mini to medium size, so the impracticalities that come with this surface are not so disruptive. The use of natural materials such as wood or natural pigments invades your work. Why don’t you use industrial-made paint or processes? Are you interested in reflecting a sort of primitivism within your practise? I use industrial paint, but there is nothing like mixing your own. When you learn where this or that pigment comes from, you start another sort of relationship with your paint/painting. When I came to the Slade, I was very tired of my ways of painting, so I went back to the beginning. I learned how to make from scratch acrylic, oil, watercolour, how to correctly use mediums, acrylic and organic sealers, primers, everything. One year was dedicated to learning the basics properly. I had lots of help at the Slade with these technical bits. But yeah, studying painting through this utterly practical perspective reflected in a more primitive way not only of painting but also in thinking about painting. Memory, observations, nature, and your daily environment feed your works. What are you inspired by? Do you paint from life? Progressive and experimental music, Tolstoy, cracks on the pavement, Thomas Hardy, the smell of pine, Émile Zola, good art, weird and suggestive forms I encounter on public environments…it is the everything and nothing, it is about the ordinary things. I rarely paint from life, it is always a translation of something I saw, or I photographed, more loosely remembered and not strictly analysed and reproduced. Your pieces seem to compliment, feed each other, and belong together as a family in a way, where you have the bigger pieces working with the smaller to the minuscule pieces. Are your works meant to belong together? Could you explain your interest composition-wise in terms of large pieces working with smaller pieces? I like to think that I can still play with the work after its completion, so scaling up and down allows the work to perform differently depending on how I install it. I love to work small; my most successful pieces are tiny. Painting on a big scale challenges me in different ways, you scale up the surface; you have to scale up the tools, the amount of paint, the gesture… Small paintings look great on massive walls actually, it stimulates a very interesting tension between the grandiosity of the wall, which pushes you back with the fact that if you want to see the painting you have to get nearer the wall, become intimate with it, confront it closer. I also like to think that each work carries something from its predecessor, like a family as you said. Your representations seem purely visual, aiming to transmit nothing but the piece itself. Are you aiming to spread any message or transmit a story with your works? We believe perception presents us the world as it truly is; nevertheless this perception is mediated by our bodily senses and by our individual life experiences. 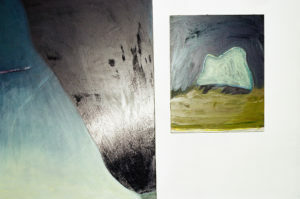 The work aims to encourage the viewer to formulate peculiar connections with our tangible surroundings as well as with our individual and unique lived experience. The paintings are not about the things themselves, but are reminiscent of these things; it is about a caught moment, a glance…this intangible portion of awareness is what I want to communicate. Your works are built up in layers and your process making allows your initial layers to be seen within the top layers. Could you develop on the importance of your process? Which artists are you interested in and why? 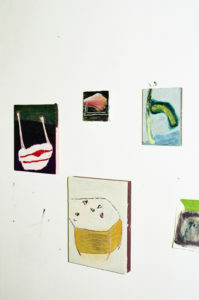 Forrest Bess, Richard Tuttle, Prunella Clough, Raoul de Keyser, Milton Avery…their paintings look so spontaneous and honest. Clough’s paintings are so good. The space and the subjects in her paintings are wonderfully worn and at the same time tended for. You were featured in our blog post expanding on artists we found via Instagram. What is your role within this social media platform? I think Instagram has the same importance for an artist as a website now. I have met many artists, gallerists, curators, and learned about new project spaces opening through Instagram. A year ago I was posting random stuff as well as my art content, but now my account is solely being used as my studio diary and as a networking tool. What about your use of colour? Why is your palette becoming more limited and darker? Yes, it has definitely become more limited. Before my work was mainly concerned with colour, whereas now my appetite for colour is shared with form, so I had to limit my palette to allow the form to have some space in the painting. As mentioned previously, your work has currently shifted in a way that you control the shapes and colour, whether in your previous works, the colour determined the shapes. Why are you evolving towards this way of working? I felt myself on a dead end with the pouring and dripping. It was great fun to be given a shape by a pour. But I felt I had done all I had to do in terms of experimenting, and suddenly felt the need to be more present in the decision-making. I still use chance, but now it is just another thing in my toolbox. The decisions are more conscious than before and I am enjoying painting again. You are currently exhibiting in a group show ‘Future Echoes’ at the Refugees Museum in Thessaloniki, Greece. What work is on view there, and how do you find your piece works within the exhibition context? I am showing some older pieces there (mainly from 2016). It felt relevant with the scope of the show, considering that my current work still carries elements of my past paintings. Can you share any upcoming projects/exhibitions/residencies with us? At the moment I am working with a Project space here in London towards a group show featuring works from Slade and RCA students. My degree show is in June 2018, so I need to focus on that before making big plans. After Slade, there are a few things I would like to do. Asia and America are on my list for future residencies. The Skowheagan programme in Maine is something I would very much like to do, but at the moment the near future is quite unpredictable.